"Roasting tones down the licorice flavor of the fennel, while enhancing the sweetness of the acorn squash. Combine those flavors with a hint of balsamic vinegar and UNCLE BEN'S® Basmati Medley Savory Herb rice, and you have yourself a great side dish to any meal." Preheat oven to 400 degrees and line a baking sheet with parchment paper or non-stick foil. Remove the skin from the squash with a vegetable peeler (if desired). Cut each wedge in half and place in a large bowl along with the fennel pieces. Whisk the olive oil, balsamic vinegar, garlic, rosemary, salt, and pepper together in a small bowl. Drizzle mixture over the squash and fennel; toss to coat. Transfer squash and fennel mixture onto the prepared baking sheet and spread out to form a single layer. Roast until squash is tender, about 45 minutes, stirring every 15 minutes. Meanwhile, prepare the rice as directed on the box. 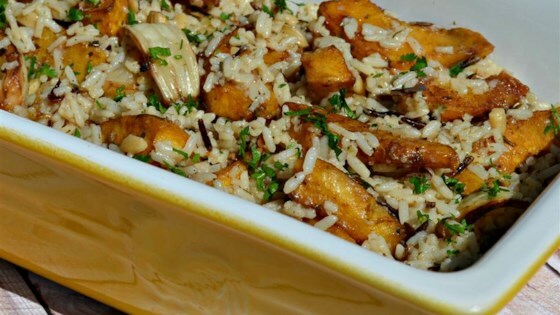 Mix the roasted squash and fennel with the rice. Transfer to a greased casserole dish. Top with the chopped parsley and keep warm until ready to serve. Husband and 3 yearold loved this. Wonderful combination! We really liked this. The sweetness of the squash and the nuttiness of the balsamic vinegar were great together. I think next time I'll add some slivered almonds to it, I bet they'd be good too.